Montreal, February 1st, 2010 – The GENIVAR Income Fund (“GENIVAR”), one of Canada’s leading consulting engineering firms, is pleased to announce the acquisition of V.B. Cook Co. Limited (“Cook Engineering“), Northern Ontario’s largest independent multidisciplinary consulting engineering firm, with over 110 employees based in Thunder Bay. As a result of this acquisition, GENIVAR now has a workforce of more than 900 employees in Ontario. Thunder Bay, ON – Friday 12th February, 2010: – Six Matawa First Nations Chiefs joined officials from Great Slave Helicopters Ltd. today to sign a memorandum of understanding (MOU) to enter into a joint venture to provide helicopter air charter services to customers within their traditional territories. Longueuil, QC, Feb. 23 – Azimut Exploration Inc. (“Azimut”) announces the signing of a letter of intent with 2227352 Ontario Inc. (“the Partner”) regarding the Diana property, a major exploration project for copper, cobalt and rare earth elements. This property, which comprises 524 claims covering a surface area of 237 km2, is located in Nunavik, Quebec, about 40 km northwest of the town of Kuujjuaq (see press release of February 18, 2010). The Calgary Chamber of Commerce has contracted with Dr. Neil McDonald of Cross Cultural Consulting Inc. to provide Aboriginal awareness training for businesses and organizations looking to improve Aboriginal hiring and retention strategies, and partner with Aboriginal communities to develop business opportunities. Ottawa, February 22, 2010 – Canada’s Task Force on Financial Literacy kicked off an extensive national consultation process with the release of a consultation document exploring key issues about how Canadians make financial decisions. Ottawa, Feb. 22 – The Canadian Chamber of Commerce warned today that the recession and rising unemployment may have diverted attention from labour shortages, but the shortages that existed before the recession will resurface after the economy fully recovers. Calgary, Feb. 19 – The Arctic Gas Symposium is the gathering place for those involved in northern projects. Now in its 10th year, this annual event continues to bring together the who’s who of the northern gas delivery world, and the communities involved. Calgary, Alberta–Feb. 17, 2010 – Savanna Energy Services Corp. (“Savanna”) (TSX:SVY) intends to release its Fourth Quarter and 2009 year end results after markets close on Wednesday, March 10, 2010. The results will be available on the Company’s web site after the dissemination has taken place over the news wire service. Thunder Bay, ON, February 17, 2010 – Rare Earth Metals Inc (“Rare Earth Metals” or the “Company”) (TSX Venture Exchange: RA) advises that the exploration program on the Company’s Clay-Howells project will be delayed pending discussions with an independent First Nations group. The Company has agreed to delay drilling activities pending discussions with various Government agencies and the native group in question. The Company has complied with all government regulations and owns 100% of the surface and mining rights to the patented land on which the drill program is being conducted. In the interim two diamond drill rigs remain on the property and on-site crews continue to conduct core logging and core sampling on the drill core recovered to date. Vancouver, B.C. – The catwalk at the Aboriginal Artisan Village and Business Showcase lit up tonight as top Aboriginal fashion designers from across Canada showcased their designs on the world stage. The recent decision by Ontario Mining Association member Northgate Minerals Corporation to develop the Young-Davidson gold mine near Matachewan will benefit the entire province. The property has proven and probably reserves of 2.8 million ounces of gold and the mine is expected to produce 180,000 ounces of gold annually over a 15 year mine life. Six young entrepreneurs are contributing their skills and services to the growth of Manitoulin Island’s business community. Saskatoon, Feb. 17 – Golden Band Resources Inc. (TSXV: GBN) is pleased to announce that further underground exploration is underway at the Company’s Bingo gold deposit in preparation for mine pre-production development work. A Northwestern Ontario First Nations community is looking into developing a hydroelectric generating facility to help reduce energy costs and environmental impacts. Halifax, NS – Federal, provincial and territorial fisheries and aquaculture Ministers concluded the annual meeting of the Atlantic Council of Fisheries and Aquaculture Ministers (ACFAM) today with agreement to move forward with concrete action on a broad range of issues, including seal management, Atlantic lobster, and the Canadian Shellfish Sanitation Program. The meeting was co-chaired by the Honourable Gail Shea, federal Minister of Fisheries and Oceans, and the Honourable Clyde Jackman, Minister of Fisheries and Aquaculture for Newfoundland and Labrador. Vancouver, British Columbia – Feb. 16, 2010 – AgriMarine Holdings Inc. (TSX VENTURE:FSH) (the “Company” or “AgriMarine”) and the Lax Kw’alaams First Nation are pleased to announce that they have signed an important Memorandum of Understanding (the “Agreement”). Toronto, Ontario – Feb. 16, 2010 – Labrador Iron Mines Holdings Limited (TSX:LIM) is pleased to announce that it has received final environmental approval and project release from the Government of Newfoundland and Labrador for its Schefferville Area direct shipping iron ore project in Western Labrador. Vancouver, Feb. 14 – Helping British Columbia “Go for the Gold” in clean energy, GE Energy Financial Services, a unit of GE (NYSE: GE), and Plutonic Power Corporation (TSX: PCC) announced today updates on construction at the 144-megawatt Dokie Wind Project and 196-megawatt East Toba River and Montrose Creek Hydroelectric Project. Announced during a 2010 Winter Olympic Games briefing today at the British Columbia Showcase in Vancouver, these facilities will be British Columbia’s largest independent wind and run-of-river projects and will help the province meet its goal of electricity self-sufficiency by 2016 by using 90 percent clean domestic generation sources. Richmond Minerals Inc. – Earn-In Confirmation On Option Agreement With Fort Chimo Minerals Inc.
TORONTO, Feb. 12 /CNW/ – Richmond Minerals Inc. (“Richmond” or the “Company”) is pleased to announce confirmation that it has executed letter agreement with Fort Chimo Minerals Inc. (“Fort Chimo”) whereby Richmond has earned a 50% undivided right, title, and interest in the Grenville Project joint venture properties (the “Properties”) more fully described in an Option Agreement dated May 6, 2006, as amended by letter agreement dated October 3, 2008 (the “Option Agreement”). Victoria – An audit of the BC Oil and Gas Commission has found that it must improve its oversight of oil and gas sites in order to adequately manage the risks of contamination, says Auditor General John Doyle in his latest report, released today. Vancouver, Feb. 11 – The shishalh Nation (Sechelt Indian Band) and Plutonic Power Corporation (TSX: PCC) announced today that a long-term Impact Benefit Agreement (IBA) has been signed that will facilitate the potential development of transmission within shishalh Traditional Territory for future renewable energy projects. Saskatoon and La Ronge, SK, Feb. 11 – Golden Band Resources Inc. (TSXV: GBN) and Kitsaki / Procon Joint Venture are pleased to announce the signing of a General Services Agreement for the company’s La Ronge Gold Project. This agreement confirms business opportunities from the project, including: underground mine development and production mining, mill refurbishment and operation, surface construction, open pit mining, ore haulage, and accommodation services. In addition, the agreement asserts the commitments that both organizations have made to ensure environmentally responsible mineral development, promotion of a safe and healthy worksite, and hiring and training for members of the Lac La Ronge Indian Band. Vancouver – A Local Aboriginal art producer, critical of the Olympics’ Aboriginal Licensing and Merchandising Program has been informed he cannot participate in the Olympic Artisan Village unless he allows approval of his communications regarding the Olympics. 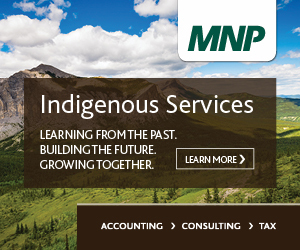 Successful Aboriginal businesses create wealth and jobs in Aboriginal communities and Canada at large. This report profiles 10 successful First Nation, Inuit, and Métis businesses from across Canada and highlights common challenges and success factors. It provides an Aboriginal business guide and other resources that Aboriginal entrepreneurs can apply to their own businesses. It also highlights some of the advantages to partnering with Aboriginal businesses. The findings in this report are based on a comprehensive literature review and interviews conducted with our featured businesses and community members as well as other business leaders—both Aboriginal and non-Aboriginal. The Vancouver 2010 Winter Olympic Games may be the world’s biggest sporting event, but when you put thousands of athletes, spectators, and media together amid a maelstrom of excitement and activity, sport is only one part of the equation. Visitors to the Games looking to really experience the local culture inevitably sample everything the Host Nation has to offer such as the food, art and of course, fashion. Vancouver, British Columbia–Feb. 11, 2010 – Northern Freegold Resources Ltd. (TSX VENTURE:NFR) is pleased to announce that it is a Shared Title Sponsor with Western Copper Corporation of the “Yukon First Nation Business Showcase & Development Program”, which is part of Project YFN 2010. Project YFN 2010 is a tremendous people and project development story that will take 70 Yukon First Nations artists and entrepreneurs to the world stage in Vancouver in February 2010. Vancouver, British Columbia – Feb. 10, 2010 – In response to yesterday’s Throne Speech, the Association for Mineral Exploration British Columbia (AME BC) calls upon the Government of British Columbia to respect existing land use plans and keep the Flathead Valley open to responsible mineral explorers. Unama’ki Economic Benefits Office (UEBO) is focused on exploring new economic opportunities for Cape Breton?s five First Nation communities and maximizing Aboriginal participation in large industry and major industrial projects in Cape Breton. Vancouver, British Columbia–Feb. 10, 2010 – Northern Freegold Resources Ltd. (TSX VENTURE:NFR) is pleased to announce it has received non-optimized initial metallurgical testwork results from the Nucleus gold deposit. The Nucleus deposit has a NI 43-101 compliant inferred resource estimated at 1.08 million contained gold ounces(1). An updated resource will be released during the first quarter of 2010. The deposit is located within the Company’s road accessible district scale Freegold Mountain Project in the Yukon. Vancouver, British Columbia – Feb. 10, 2010 – First Coal Corporation (FCC), a privately held coal mining company developing properties in northeast British Columbia, will move directly into the Environmental Assessment (EA) process regulated by the BC Ministry of the Environment instead of seeking a small mine permit as originally planned. A new small business centre in Wabigoon Lake Ojibway Nation is supporting the local economy and job creation. The centre was constructed to help local First Nation entrepreneurs and create employment opportunities for members of the First Nation. VANCOUVER, Feb. 9 – Net income for the second quarter ended December 31, 2009 was $207,903 as compared to $274,300 for the corresponding period in fiscal 2009. The net income for the second quarter of fiscal 2010 included a recovery of income taxes of $160,000 as compared to a recovery of income taxes of $50,441 in the second quarter of fiscal 2009. Further, no payment by the First Nation of contractor fees was received in the second quarter of 2010 whereas, in fiscal 2009 a contractor fee of $150,000 was received as part of the payments towards the Kyuquot powerline. Sound communication is critical to the successful implementation of the Tripartite First Nations Health Plan. It is essential that key messages and information flow between the FN Health Society and First Nations communities, political leadership (both Government and First Nations), Federal (including HQ and Region) and Provincial (including Health Authorities) partners, other Health Partners and the FN Health Council. The FN Health Society has recently concluded a communications strategy, and a Tripartite Communications Plan. Both documents are aimed at ensuring seamless, relevant and accessible information is available to Health Plan partners. Community voice is critical, as we strive to continuously improve upon existing strategies and approaches. Serpent River First Nation, ON, Feb. 8 – Chief Isadore Day, Wiindawtegowinini on behalf of the Board of Directors of the newly formed Lake Huron Anishinabek Transmission Company Inc. (LHATC), hosted a successful inaugural meeting in Serpent River First Nation today. The First Nation community of Potlotek (Chapel Island) partnered with the Unama’ki Economic Benefits Office (UEBO) to deliver a day-long series of business workshops. The title for the Feb.1 workshops was “Let’s Build Stronger Communities”, or “Ke L’tunej Naji Mlkiknaql Wutanimal” in Mi’kmaw. Workshops included, “Entrepreneurship and Economy Building”, “Career Planning” and “Best Practices in Community Economic Development”. Cape Breton University and the St. Mary’s University business development centre’s presented on economic development best practices and the power of community inclusion and identifying opportunities through asset mapping. Vancouver, British Columbia–Feb. 8, 2010 – Brett Resources Inc. (TSX VENTURE:BBR) (the “Company” or “Brett”) is pleased to announce that the Sawbill North road was officially opened on February 2, 2010. Approximately 26 kilometres in length, this road provides a shorter link between Brett’s mineral properties in the Hammond Reef Area and the community of Atikokan. The road will also provide access for other resource related activities in the area. Saint-Séverin-De-Proulxville, QC, Feb.5 – Following an audit process conducted by an independent organization, fifteen forest companies obtained Forest Stewardship Council (FSC) certification for their management practices on two Forest Management Units, FMUs 041-51 and 043-51, covering a total area of more than 1.5 million hectares. FSC certification is considered globally as being among the most stringent responsible forest management standards. Edmonton, Alberta – Feb. 5, 2010 – Twin Butte Energy Ltd. and Frog Lake Energy Resources Corp. (a Frog Lake First Nation Company) are being honoured for their joint venture partnership in the creation and operation of a successful, and growing oil and gas company. WHITEHORSE – The parties tasked with completing the Peel Watershed planning process have signed a joint letter of understanding (LOU) outlining their commitment to move forward on the work needed to continue the Peel Regional Land Use Planning review and approval process. Whitehorse, Yukon, February 4, 2010 – The Honourable Senator Daniel Lang and the Honourable Archie Lang, Yukon Minister of Highways and Public Works, Community Services, and Energy, Mines and Resources, today announced joint funding of $600,000 for local road infrastructure improvements in the territory. VANCOUVER, BRITISH COLUMBIA–Feb. 4, 2010 – NaiKun Wind Energy Group Inc. (TSX VENTURE:NKW) distributed a quarterly project update to shareholders after the close of markets yesterday. The content of the update appears below. Trivello Energy Corp. (TSX-V “TRV”; the “Company”) is pleased to announce that it has acquired the historic Tom Gold Mine and related claims, located approximately 10 km northeast of Yellowknife, NWT. TORONTO, Feb. 2 – Fortune Minerals Limited (TSX-FT) (“Fortune Minerals” or “the Company”) is pleased to announce the appointment of Mr. Jared Orynik, P.Eng, as Senior Metallurgist for the Company’s proposed Saskatchewan Metals Processing Plant (“SMPP”) to be built near Langham, 30 km west of Saskatoon. Fortune Minerals’ SMPP will use modern hydrometallurgical process technologies to treat bulk concentrates from the Company’s wholly-owned NICO mine in the Northwest Territories to produce high value metal products, including gold, as well as cobalt, bismuth and copper cathodes. The NICO mine and concentrator is currently undergoing the second half of an Environmental Impact Assessment in the Northwest Territories, and the SMPP is undergoing a separate concurrent permitting process in Saskatchewan. A new northern communications company has been formed to serve the Horn River Basin in northern British Columbia. Waterways Communications Limited Partnership (LP) is the result of a new partnership between Northwestel and the Fort Nelson First Nation. In partnership with GeoConnections, the First Nations Technology Council is responding to requirements of all First Nations in British Columbia for a common and interoperable information resource that will enable better information sharing and result in improved decision-making. The First Nations Information Support Services (FNISS) is fulfilling a high priority need of all 203 First Nations and 39 tribal councils within British Columbia by providing access to current and reliable cultural, land and marine resource information and information management tools. Standardized access to essential location-based datasets and tools will support the function of strong First Nations governments and economies. Ottawa, Ontario – Feb. 3, 2010 – Leading-edge technology and innovative leadership has earned Toronto’s Vroomen.White.Design the title of Canadian Manufacturer of the Year. The National Energy Board is hosting a conference in Ottawa, Ontario on March 12, 2010 to discuss long-term energy issues. This is a no-cost one day event for energy market analysts. Attendees include representatives from the energy industry, government, regulatory agencies, environmental non-governmental organizations and academia.